Submitted Photo Scott McKinney, manager of Technical Services at the plant, is pictured at right presenting the donation to Jason Kester (center), SOPA’s Executive Director, and Adam Phillips, Asset and Site Development Manager. 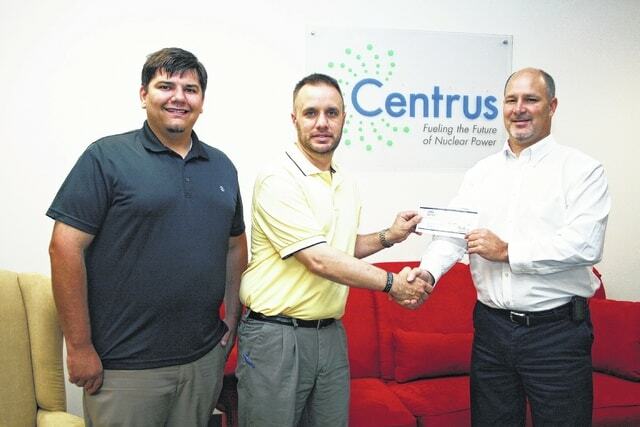 PIKETON, Ohio – Centrus Energy Corp. recently provided a $2,500 investment to the Southern Ohio Port Authority (SOPA). This agency serves as the economic development office for Scioto County and is working to market the region’s assets to attract new business, retain and grow existing businesses and develop shovel-ready sites and buildings. Portsmouth was recently named as one of 50 quarterfinalists in the America’s Best Communities competition. This phase of the competition includes a number of requirements, including that the community must develop and finalize its revitalization plan and obtain $15,000 in matching funds from within the local area. Centrus’ donation helps SOPA in its goal to raise the matching funds, which could help the community win $100,000 to implement the revitalization plan if it places in the top eight nominees. The top three winners of the competition will receive $1, $2 and $3 million respectively to assist with their economic revitalization efforts. For more information about SOPA, visit online at www.sohpa.org.